It is well documented that a change of residence (whether it is buying a new home or moving in with some friends) is a very stressful experience. This is even more so in London where the cost of living is high and the lifestyle is fast. 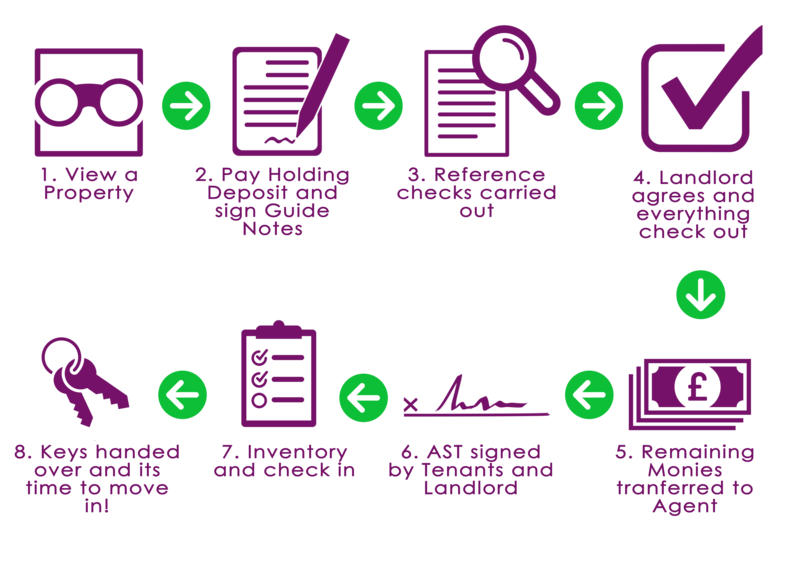 For our tenants and applicants, we would like to make this process as easy as possible. That is why we have created the guide below that will detail the typical stages and procedures that are carried out before and during your search for a new home to move into. There are a number of ways to find a rental property. The most common approach is typically online; the most common and reliable sites being Rightmove.co.uk and Zoopla.co.uk. You may find while searching through these sites that when you phone up the estate agent, the property has already gone. This is due to the high demand and the fast-pace business of renting! Once you have seen a property that you like and have arranged a viewing, you have the ball rolling. Applicants will usually look for a rental property 1 to 2 months before the desired move-in date. This allows time for references to be obtained and conditions of the property to be met. If the property that you are viewing is what you are looking for, it’s time to pay a holding deposit and sign the Guide Notes. This holding deposit reserves the property for you while the references are carried out. It is also a sum that is deducted from your first rent payment. The Guide Notes highlight what the applicant has to do before the tenancy, as well as during, for example, to; pay the rent, change a tenant, log their deposit etc. This is the point where you can make requests for any conditions of entering the property. Once the Guide Notes are signed, the decision is dependent on the results of the references and the Landlord. Once the referencing checks have been carried out and have come back approved, they are sent over to the Landlord to for agreement. This can take anything from a few hours to a couple of weeks depending on the Landlord’s situation. However, we do try to get this done as soon as possible so that in the unlikely case that you have to search for another property, you will have your holding deposit back to place on another property. These will be outlined in your Guide Notes that you will sign at the start of the process. So that the move-in date is not delayed, we ask that the funds are transferred into the selected account five days before the move. If we do not receive the funds, we are not able to allow you to move in. AST is an abbreviation of ‘Assured Shorthold Tenancy’. It is a contract that outlines all the dos and don’ts for a residential dwelling. It will state the rules and covenants that you and the Landlord agree to. It will also contain other information that you will need to know for your tenancy. We have made our ASTs easy to read and comprehensive to make sure it covers both you and the Landlord so that your time in the property is safe and enjoyable. The tenancy cannot start until the remaining monies have been transferred to the selected account and the AST has been signed by both parties. Most Landlords opt for an inventory to be drawn up for the property. An inventory catalogues everything in the property and its condition. This is not only for the Landlord’s benefit but more so the tenants. Many tenants have an issue with not receiving their deposit back at the end of the tenancy. If damage is caused and the item is in worse condition in comparison to the state at the start of the tenancy, the inventory will show this and the cost to repair the damaged item will be deducted from the deposit. Conversely, if a wall was damaged prior to the tenancy and it has been levied from your deposit, the applicant will have proof that this is of no fault of their own. A check-in is the second part of the inventory and doesn’t take too long. It is an accompanied inspection of the property where you and a clerk to go over the condition of the property. You will also have the opportunity to double check the inventory. 8. Keys handed over and it’s time to move in! Once the AST has been signed, the monies transferred and the inventory carried out, it’s time to hand the keys to you and for you to move in! However, if you have grown attached to us during this process, don’t fret! Most properties that we let out are managed by our team at Alexander David Property. They will be happy to discuss your issues and suggestions for the property and take any stress of repairs and maintenance away from you. Administration Fees: £300 (inc VAT) for each property. Referencing Fees: £72 (inc VAT) for each tenant. If a guarantor is needed, an additional £60 (inc VAT) is charged. Prices may vary in accordance with reference scheme use by Landlord. Alexander David Property Ltd is a member and regulated by the The Property Ombudsman and The National Approved Letting Scheme. How will I know my deposit will be safe? Every deposit is held in a government controlled scheme, we like to use the Deposit Protection Service (https://www.depositprotection.com/about). Once we get the deposit into our account, we send it over to the DPS where it is held in a separate account to ours and cannot be touched without your agreement and until the tenancy has expired. You will get a certificate sent through with a unique reference number that can be used to retrieve your deposit at the end. The main benefit of this service is that if you do not agree with a deduction from your deposit at the end of the tenancy, you can appeal it. The deposit will not be released until both parties have agreed on any proposed deduction.